Infrequent postings without mention of a blogging break might suggest something is amiss. How much to say in a garden blog on plants/birds/wildlife is a tricky one. It would be very easy just to say there’s been no free time to blog this summer. That would be partly true. As the UK sees some late September, balmy weather I’d like to wish everyone the time and opportunity to enjoy this second chance of summer! I’m guessing the barbecues and garden tables will be coming back out of storage. 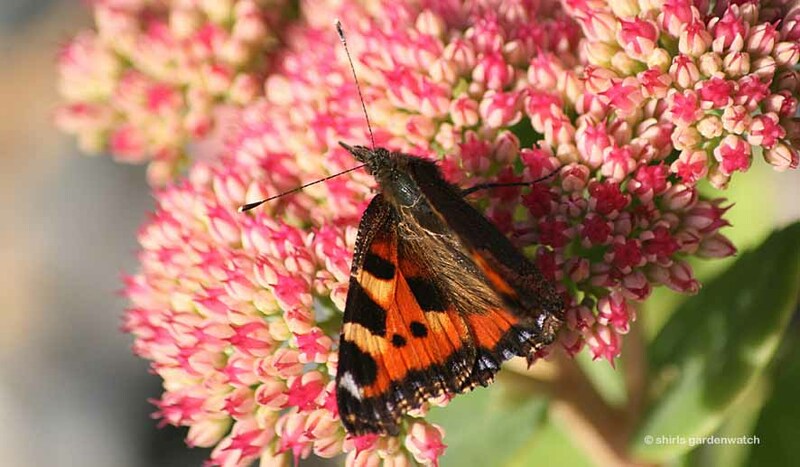 I was hearing in the news this morning that many pruned plants have re-flowered which must be great for bees and butterflies in particular. My front garden sedums are looking wonderfully rich in colour now (not images shown here). 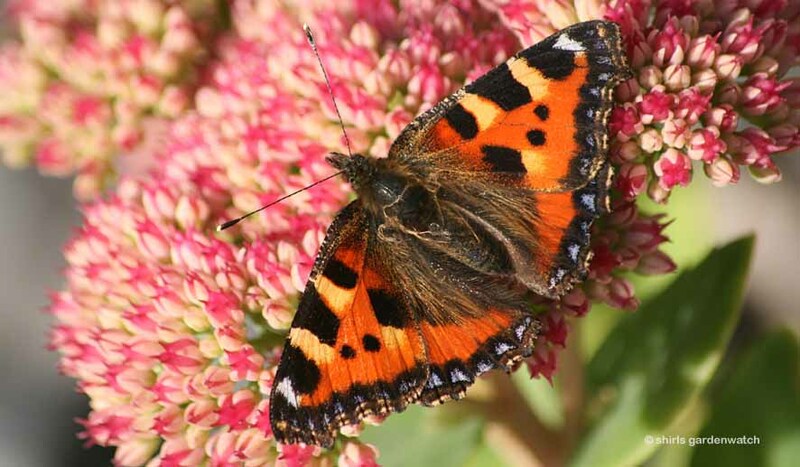 I haven't seen butterflies on them recently but I’m guessing they are visiting now. 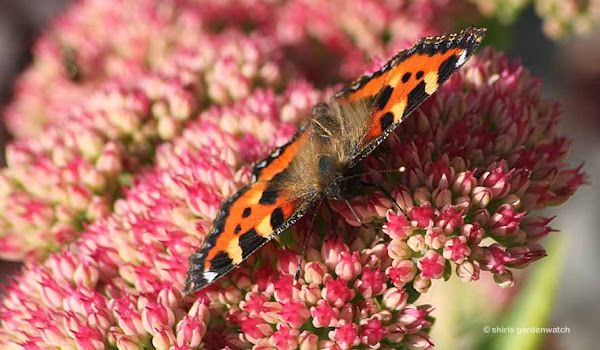 Back in the first week of September the you can see the tiny sedum flowers were only just opening and I captured a few butterfly visits with my cameras. 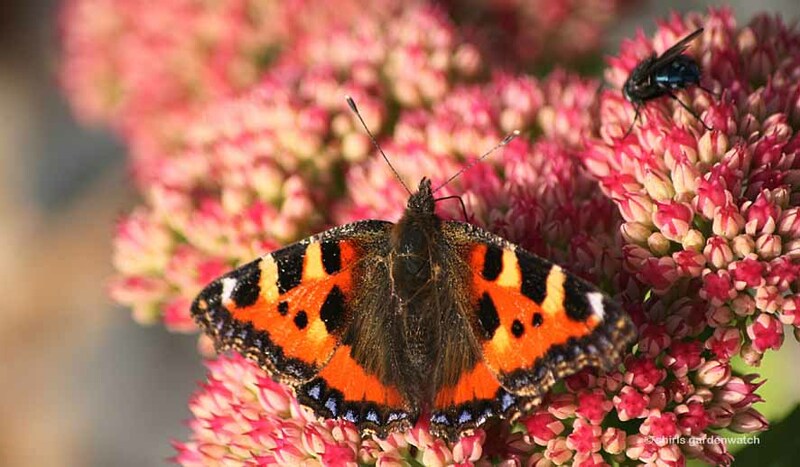 Peacock and Red Admiral butterflies can be seen feeding on buddleja (now past flowering) in my previous post. 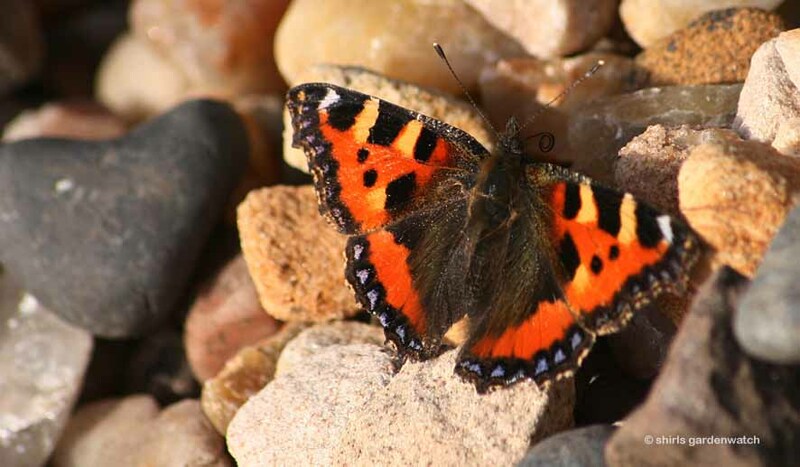 The Small Tortoiseshell butterfly can be seen in this post just a few days later and the day before we received the news we had feared all summer. I’d like to dedicate this post to the Consultant & Radiographer at our local Hospital (Perth Royal Infirmary) who felt they didn’t have a good enough image of my husband’s kidney stones (annual check) and requested a more detailed image. They picked up a much bigger problem. 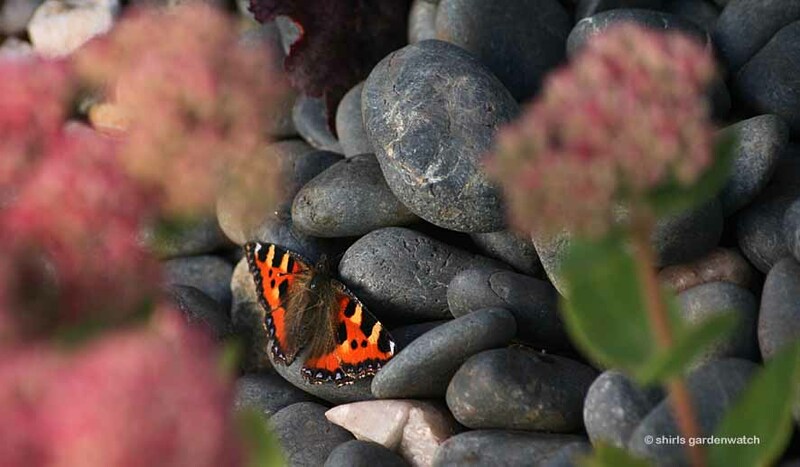 During the waiting times between hospital letters and further scans my garden with its plants, birds and hedgehog visitors should have been a place of comfort. However, as my blog and subsequent cameras and nestboxes only came about due to my husband’s encouragement and support I could face neither. I actually avoided looking out the window (weeds have taken advantage of this) and my PC remained in a tidy, unlit corner of the room in the evenings. Cameras also remained in bags and being truthful bird feeders were being filled infrequently and hedgehogs lost out completely. The dreaded news we received the day after the photos in this post were taken was that my husband had a tumour in his pancreas. This news came from a specialist in a different hospital. Three weeks ago today we had no idea how quickly things were about to happen. We only had the weekend to break this news to our daughters (18 & almost 21), my husband’s elderly parents, my elderly parents, immediate family and close friends. Although very hard to do, we had one clear message for everyone – this was positive news too. The stats we were given by the surgeon was that in 85% of the cases where a tumour is found in the pancreas nothing can be done. My husband was already in the 15%. Although not a small tumour, it was in a rare position in the centre of the pancreas and surgeon’s deemed it operable. Although a scary operation lay ahead this was a very lucky break. I’ll fast forward past a laparoscopy (to see if Cancer had spread outside the pancreas - it hadn't). I’ll fast forward past the operation that involved the tumour being removed with a large part of the pancreas (my husband will inevitably become a Type 1 diabetic) to test results being expected any day now. We are back at the waiting game. My carbon footprint isn’t looking too healthy at the moment, but I’d like to share a final surreal image/moment with you. The night before my husband went into hospital for his Op we knew would be hard – especially for our daughters. We couldn’t stay in. Don’t’s ask me why but I decided to drive everyone into the Centre of Edinburgh on a bit of a road trip. It was a Saturday night with Uni freshers out in force, Stag & Hen night’s, Tourists and locals. The streets were buzzing and with windows down we went people watching! This is not my photo, see original image here. The striking blue neon text above is by the Scottish Turner prize winning artist Martin Creed. This work has been on show much longer than the gallery had originally intended. I wonder how many other people have found this as spookily poignant as we did that night. ‘Everything is going to be alright’ with my husband’s health - well we’re a bit away from knowing that yet. We are keeping our positive outlook. I won’t ever forget the moment my daughter read the text above out and I looked across to see the words. We won’t forget that night we spent together either. This post was written by Shirley in September 2011 for shirls gardenwatch. May you all sleep peacefully tonight. Thank you for sharing - both your beauty and your struggle. I just ambled in to your blog this evening and was wowed by your serendipity evening . . . finding the Neon lights. I can imagine the chills that ran up your arms and down your back! Our family has been in a similiar situation, healthwise. Within 30 days or so of realizing something was "wrong" with my 66 yr old brother, the docs tested, found, performed major brain surgery and removed a sizable, cancerous tumor. Now Bro is doing radiation and chemo but his "news" isn't as positive as your husbands. So, from Nance, here in the States, I will think of you and yours each day and send positive thoughts and prayers. And I'm a kindred spirit when it comes to plants and flowers and birds. Please post when you can. I do understand the part about now being able, even, to look out the windows. I too am glad you wrote this blog and hope that all is well again. I think many of us know exactly how it feels to have something like this happen in the family so you are no alone :) My brother had a tumour at only 16 and everything too went very fast i.e. went to the docs, I was sat in the waiting room for him. He came out with mum and we all headed straight for hospital... He was lucky that it hadn't spread because he'd had it for a good long while before plucking up the courage to get it looked at. Shirl - What a time of it you and the family have had. So happy to hear that your husband is back home and I am sending you and your family lots of love and gentle hugs. Hello everyone and thanks for your comments. Janet, thank-you, I hoped it would be the right thing to do. Julie, many thanks, we did. I hope by sharing this may help someone else too. Karen, it’s certainly not been easy, so many families face this every day too. We are very happy to have my husband temporarily home. Thanks for your good wishes. Hello Nance. thanks for sharing your situation here. I know that must have been hard for you to do. I hope your brother keeps comfortable and in good spirits and you are able to enjoy the time you spend with him. Hoping the outlook turns positive for him. Not having the results of the tests here yet, we don’t know which way it will go for the future. If the tumour is found to be cancerous treatment is likely. We are just trying to keep a positive outlook for whatever lies ahead. Thanks for your good wishes and yes that sign gave a weird sensation that night. Hi Liz, it helps tremendously to know that people are okay/glad that I wrote this post. Cancer stats remind us that so many families will be in/have been in the same situation us we have found ourselves in today. We absolutely know we are not alone. Thanks for sharing your brother’s situation. Don’t know if you were younger or older, but to have a brother at 16 with a tumour must have been horrendously hard for you to cope with at the time. I’m not surprised you shed tears now at the thought of someone facing the same. The shock and pain of something as huge as this will never leave you. We just have to find a way to live with these very difficult situations at the time and keep going. At the moment we are taking one stage at a time. Hello Christina, I’m sorry, I was a bit wary posting may upset some visitors. I tried to indicate (more generally) that things were difficult at the moment in comments outside my blog so it wouldn’t be such a shock if I did publish a post. If this post will be of comfort to just one person then I will feel I have made the right decision to share this. Enjoying the NOW is something we have tried to embrace for some years now. Thanks for adding that here. Thanks for your good wishes too. 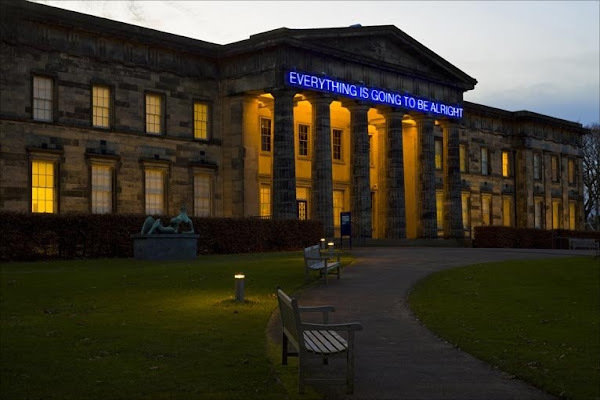 Shirley...what a post...I love the work of Martin Creed...he gets a lot of flak from the traditionalists but I think he's trying to see what is outside the box. I'm sure that God knew that you would all see that and be encouraged. I love St. Julian's quote..."All will be well, and all will be well and all manner of things will be well" for the same reason and I love Ecclesiastes for the bit that tells us that for everything there is a season. I pray that strength will come to you all even if it's like the children of Israel...little by little! Oh Shirley I am so glad to hear that your husband is beating the odds. He is young and strong. I will keep him in my prayers. You and your daughters too. It is a battle. No wonder you haven't posted. You don't ever have to apologize for not posting. You can be sure you are missed though. Big hugs. Shirl, so glad you posted...I was thinking it was a long time since you shared your garden and birdlife adventures. You had other things to focus on, so I do hope you will keep us updated. God Bless...better times ahead. Hello again Gerry, thanks for your considered words and quotes. We are taking things as they come and trying to look no further than that for the moment. As an artist, it’s great to hear that you love Creed’s work. I have to admit to never having heard of him. Yes, not a traditionalist I can see that. From my search for images I can see there was a little controversy over this piece coming down. Hello again Lisa, Caroline and Brenda. Lisa, thanks. We may have a bit to go yet depending on the outcome of the biopsy’s but the tumour is out so we can go on from there. Yes, the docs too have said that he is young and otherwise healthy so he is in a good position to treat. Still a waiting game though. Thanks for your thoughts and good wishes. It’s lovely to know I’ve been missed in Blogland. Brenda, I love your description ‘garden and birdlife adventures’. Yes, they have not been foremost in my thoughts. However, I have one update for you - it’s been hard to miss the excited, chattering House Martin chicks high above my front door every time I’ve been driving back and forth to the hospital. I have caught an odd bit of video footage of them that I’ll share one day. Thanks, we’ll take one stage at a time. Oh goodness I was in tears by the end of your post, I could emphasise with so much and knowing what you went through a few years back I really felt for you. I am so glad that there is chance of a second chance. Hello again Helen, I’m sorry I brought you to tears just as your post on your sister did me. I have thought of her recently when my husband was given meningitis and other immunisations pre Op. Now being without a spleen he is open to infection and is going to be on a low dose of antibiotics for the rest of his life. Thanks for your thoughts and understanding of our situation which must have stirred some memories of a very difficult time for you. Thinking of you too. (((Hugs))) to you and your family, Shirl. Thank you for sharing. I think the reposting of the neon sign is an omen of more good luck on the way... at least, I hope so! Oh my I am so sorry to hear about all that your husband and the family has been going through. The prognosis sounds good so far and I am sure he is glad to have a weekend furlough.I think it is good for us sometimes to write and share our concerns with others and get it off of our shoulder for a while. This is a wonderful community of people and I know your husband will be in theirs and my prayers for a complete recovery. Take care. Shirley, what a wonderful message of hope you and your family received on that drive. Here's hoping that all will continue to go well and that your husband makes a full recovery. Taking things in order: brilliant flutter photos. A well set out account Shirl. Thinking of you all and wishing that all goes well. Eight years ago I had a major op to remove my bladder as it had a vigorous cancer which fortunately was caught before it spread. It is truly amazing what can be done these days. Early days are difficult as it takes time to know a long term outcome. To begin with I looked on each day as a bonus. I would start worrying about a week or two before each six monthly check up and mightily relieved when they eventually moved them to yearly. Hi Kim, Lona, HC, Anna & John. Thank-you to you all for your comments and good wishes. Sorry I’ve been slow to reply. Kim, thanks. Perhaps you were right. Lona, thanks. Taking each step at a time was the only way to go. The weekend break was a huge boost to us all. After two nights back in hospital, this afternoon I’m going back to bring my husband home. Thanks, a good recovery is what we are hoping for now. horse care, thanks. The message that night was surreal. Yes, a full recovery will be good. Anna, thanks for your thoughts. Unfortunately, my garden became a place I have avoided looking at and being in. The birds do need my attention now with our breezy, chilly weather (we only had one day of the September heat wave). I must go to my shed and unearth extra feeders, wash them and refill them soon. I also have an update to post. Hi Shirl, sorry I missed this post, I'm glad to hear things are on the up and hope your husband continues to make a full recovery. Mike. You will be in my thoughts and prayers as will your family. Hugs to you.